Prop comic Gallagher collapsed on stage in a coronary-like incident at the Whiskey Bone Roadhouse in Minnesota last night. I’m completely up on this news item but have only a cursory grasp of the details of the 8.9 earthquake and tsunami that hit Japan. The 64 year-old comedian complained of pain in his left arm and shortness of breath earlier in the evening, but put his art ahead of all else. 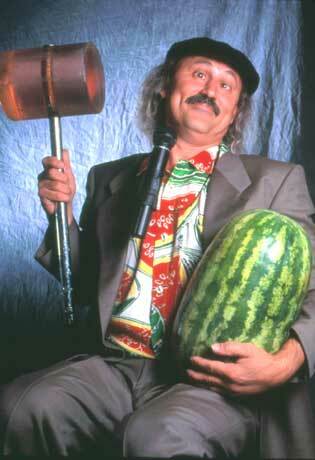 The collapse, caught on cell phone video, came while doing his famed watermelon-sledgehammer routine. The AP version of the story includes a single-sentence reference to the routine in its closing paragraph: “Gallagher, whose real name is Leo Anthony Gallagher, is best known for smashing watermelons with a sledgehammer.” I took an advanced journalism class in high school and can safely say that all anyone need know about competent reporting is contained in that sentence. Anyone considering a move to rural Minnesota should pay careful attention to the Gallagher video; particularly the exuberant audience approval for his routine in the seconds leading up to the collapse. It might be enough to just note that someone was actually recording this bit on his phone – the guy’s been doing it for forty years now. I was at a casino in South Shore Lake Tahoe about twenty years ago hanging around the bar outside a Gallagher show, and observed hotel security escorting a disruptive audience member out of the theater. I noted that he must have been sitting somewhere in front because he was still wearing the protective tarp with chunks of fruit all over it. It made me wonder what you have to do to get kicked out of a Gallagher show. In the realm of theater etiquette, it must be considered a fairly low-set bar. Had Gallagher died, the prop comic torch would likely have been passed to Carrot Top, his red-headed, anabolic steroid-using disciple. Say what you will about prop comics, they don’t come with much pretense. You wouldn’t catch either of these guys making indulgent, feature-length documentaries like Jerry Seinfeld, lamenting the loss of his diamond-cut comedic timing while returning to stand-up from his obscenely lucrative television career. This overtly needy personality trait is central to the psyche of many a comedian. Observe Orny Adams in the above-mentioned Seinfeld doc if you’ve ever thought it might be fun to know one of these guys personally. Prop comedians, on the other hand, are fully aware of the space they occupy on the comedy hierarchy, and it takes a certain resiliency to forge ahead, cognizant of this ranking. There aren’t many lining up to replace Carrot Top when he’s gone. This was written by admin. Posted on Friday, March 11, 2011, at 12:27 pm. Filed under Posting. Bookmark the permalink. Follow comments here with the RSS feed. Post a comment or leave a trackback.